The ever elusive end stage of mental illness that only seems to exist in the minds of those who are not living through it. Perhaps you’ve felt pressure from others who expect your recovery to be a steady progression without bad days or backslides. They think one day your problems will all be behind you and you’ll somehow become this new version of yourself. Someone who isn’t struggling. Someone who finally has it all figured out. Because in recovery, you’re supposed to be better. Better than before. Better than the person you used to be. The word “better” can be a real trap if you let it. This simple adjective can impose some serious weight upon those seeking to attain it. It’s perfectly healthy and quite common to desire a better state of being—especially for those suffering from any sort of mental illness and/or in recovery. Better is a real and attainable goal with true meaning, but unfortunately, we all too easily lose ourselves in others’ definitions of the word. Better should not equate to another’s expectations of you. Better should not correlate with the disappointments of those around you. Better does not have to be a hurdle you successfully jump over. Better can look like falling flat on your face but having the courage to get up again. Progress to you is not the same as progress to an outsider looking in, particularly when it comes to mental health. No one can fully understand the intricacies of your journey. Your recovery is just that, yours. Therefore you get to define what progress means to you. You get to define better. Because only you know what any of that looks like. Only you know how better really feels. But defining your own recovery doesn’t come without responsibility. We still have to hold ourselves accountable and heed the advice from mental health professionals and consider the guidance from our loved ones when appropriate. And when we get to decide what better represents, we’re freed from the burden of expectancy. In recovery, you’re allowed to stumble. You’re allowed to fall apart and want to turn around and go back the other way. You don’t have to enjoy every step. In fact, you can outright hate it at times. Recovery isn’t about joyfully skipping with a broad grin on your face, scattering flower petals everywhere; it’s not about pretending to be happy without the slightest reminiscences of your old life you’re too terrified to admit you sometimes miss. Recovery is brutal and unpredictable. You can be better while still struggling with those same, old demons. You can have the best week followed by the hardest day. You’ll suddenly find yourself tempted despite years of sobriety. The habits you thought were long gone only to be found hiding just around the corner. But just because your recovery feels erratic, it doesn’t mean you’re not getting better. Better is learning to navigate those ups and downs without letting them derail you—and even when they do—better is knowing you can always get back on track. Better isn’t a smooth drive through a prairie abundant with sunshine. It’s a path down arduous terrain with unforeseen cliffs and obstacles that force us to slow down or reroute. Better looks different for everyone. Trying is better. Effort is better. Perseverance is better. 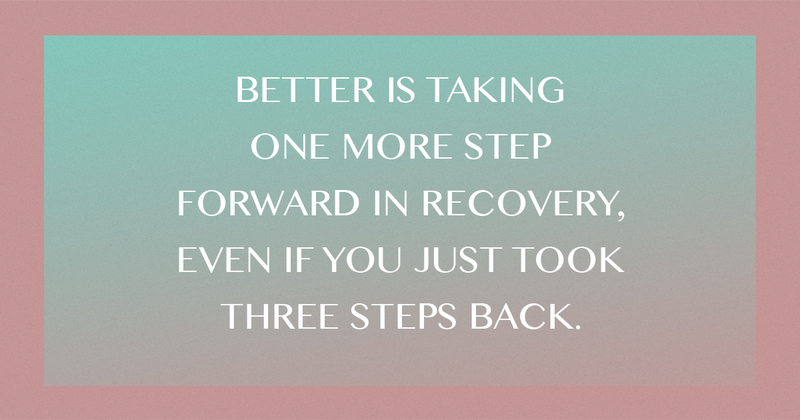 Better is taking one more step forward in recovery, even if you just took three steps back. Better is seeking progress without keeping score. Recovery isn’t a race when better has no end game. Try. Fail. Kick. Scream. Cry. Quit. Restart. Fall apart. Push forward. Fall backward. Start again. Very good timing on this. I needed this. Thank you so much. Thank you from a Mom who is always trying to better understand my son’s struggles with mental illness. “Better?”… this was very enlightening on so many levels.